Searchers now have the benefit of infinite scrolling on your results pages. What is infinite scrolling? You’ve probably used it on many commercial websites, such as Bing Images (External link), Duck Duck Go (External link), Pinterest (External link), and Twitter (External link). It automatically allows searchers to see more results when they get to the bottom of the page, without clicking on the link for the next page of results. Try it out on your site’s search results page, or on USA.gov. Speed. The next set of new results loads quicker than a totally new page. Streamlining the user interface. Studies show most searchers don’t use the next page buttons. Proactively loading results allows searchers to see more results on one page and to compare them. Simplifying the indexes. 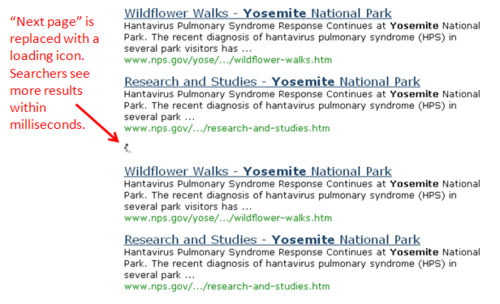 When and how we display results from our various web indexes is easier for us, you, and end users. 2. Helping searchers find forms. Similar to our existing agency and health GovBoxes, we created a forms GovBox to help searchers find federal government forms. So far, we’ve included forms from the Department of Defense, General Services Administration, Social Security Administration, U.S. Citizenship and Immigration Services, and Department of Veterans Affairs. We’ve also published the forms data as a Federal Forms API for third-party developers. Covering tens of thousands (or even millions) of web pages. Covering domains that aren’t part of your primary domain (i.e., that aren’t shown on the main web results page). We upgraded our robots.txt parser to account for comments and varying cases. We eliminated support for six legacy domains as part of the .gov web reform project. We fixed broken URLs for Best Bets image files. We fixed a bug with our browser user agent so that Internet Explorer users no longer sometimes see a blank results page. We fixed a CSS validation bug so you don’t see an error message when editing your header or footer. We updated a broken link for Explore Topics on m.USA.gov.